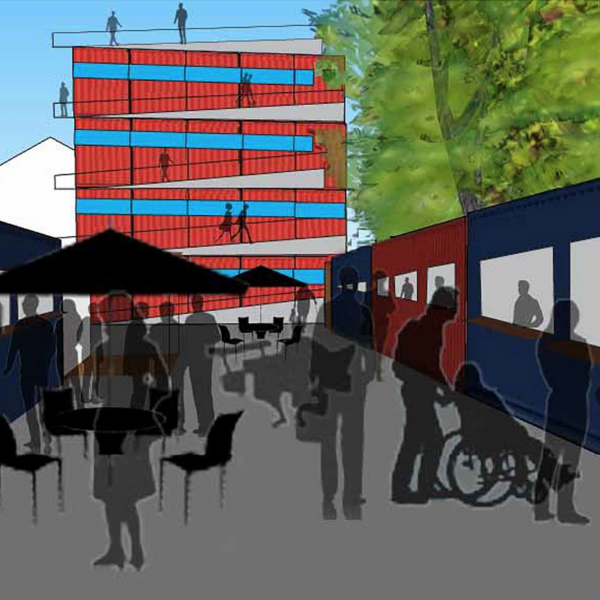 Container Campus investigates the feasibility of animating the Ryerson University campus with shipping containers that have been repurposed for new uses to help serve the needs of the Ryerson community. The repurposing of shipping containers, for uses other than the transportation and storage of goods, is known as cargotecture. The constrained urban location of Ryerson’s campus and its steadily increasing enrollment rates have fostered a keen interest on the part of the University to find low-cost, flexible, and innovative means to animate the campus, create additional usable space for students, and advance the city-building mandate of Ryerson. The students determined that cargotecture is a viable means of fulfilling these objectives. The students proposed three unique scalable options. The first project is the ThemeBox, a single multi-purpose container that physically changes locations to service specific seasonal needs in order to provide students access to services and entertainment as a means of fostering community. The second proposed project is Ry Docks, a marketplace inspired by Scadding Court Community Centre’s Market 707 with some notable additions. The last, and largest scale project, is the Study Centre, which is comprised of 25 boxes stacked together to create a compelling architectural intervention. These cargotecture projects demonstrate Ryerson’s commitment to sustainability and architectural innovation while providing the campus with much-needed amenities and new destinations in which to gather and foster a greater sense of community.